The following predictions are based on the ELO ranking system. This system was first used in Chess to calculate the skill level of players and predict the most likely winner. 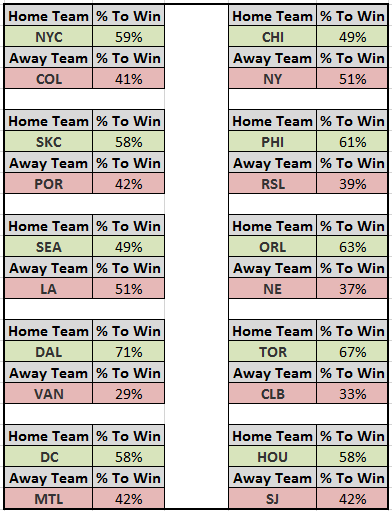 Since soccer can end in a draw, I’m using a modified version of this formula that tries to predict the chance that a team will come away from a match with points (either as a win or a draw). The system starts each new team at a score of 1500 and then adjusts their rating as the season goes on. 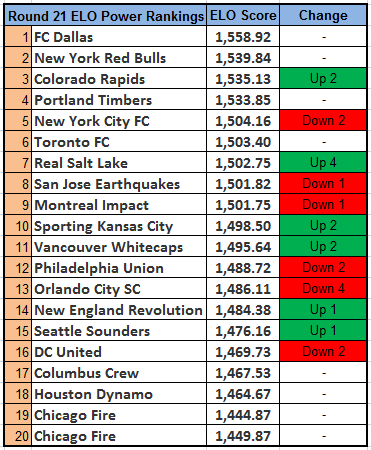 My current team scores include data from 1996-2015 (with some adjustment to account for the changing MLS win/draw rules). What is not included are games from Domestic tournaments, preseason friendlies, or international games. These scores are how I rank teams for my Power Rankings table and the values are now included in the chart.